Probing Question: What are Shooting Stars? In the early morning darkness on April 15, 1912, as the R.M.S. Titanic was sinking in the freezing Atlantic, survivors witnessed a large number of streaking lights in the sky, which many believed to be the souls of their drowning loved ones passing to heaven. Says Kevin Luhman, what they most likely were seeing was the peak of the Lyriad meteor shower, an annual event occuring in mid-to-late April. Though folklore of many cultures describes shooting or falling stars as rare events, “they’re hardly rare or even stars,” says Luhman, Penn State assistant professor of astronomy and astrophysics. “From the dawn of civilization people have seen these streaks of light that looked like stars, but were moving quickly across the sky,” he notes. “These ‘shooting stars’ are actually space rocks—meteoroids—made visible by the heat generated when they enter the Earth’s atmosphere at high speeds.” These bits of ice and debris range in size from a speck of sand to a boulder. Larger objects are called asteroids, and smaller, planetary dust, Luhman explains. Most meteoroids are about the size of a pebble and become visible 40 to 75 miles above the earth. 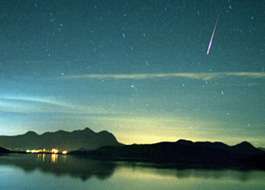 The largest meteoroids, called “fireballs” or “bolides,” explode into flashes so bright they can be seen during the day, says Luhman. The very best viewing times, when “you might see one or two meteors per minute,” says Luhman, are the eleven or so meteor showers each year when Earth passes through a debris trail left behind by a comet—a giant ball of ice and grit also orbiting the sun. “They are named after the constellation in the sky out of which the meteors appear to come,” Luhman explains, noting the Leonid and Perseid showers as the most famous and spectacular. The Perseids, appearing every August and named for Perseus, occur as Earth moves through a thousand-year-old cloud of cosmic debris ejected from the comet Swift-Tuttle, last seen in 1992, and—at six miles across—the largest object known to make repeated passes near Earth. Says Luhman, it would have been hard to miss the falling lights of the 1833 Leonid meteor storm, which were so bright and fell so fast, about 100,000 in an hour, that many feared the end of the world. The storm, widely regarded as the birth of modern meteor astronomy, marked the discovery of the Leonids, visible every November 17 and caused by debris from the comet Tempel-Tuttle. Some meteorites even tell us about planets. “If a comet or asteroid hits Mars, it can throw some of the pieces of the crust into space and, after millions of years, some of that material falls down to Earth’s surface,” says Luhman. One of 34 Martian meteorites reached fame in 1996 when NASA scientists announced it showed signs of primitive life from more than 3.6 billion years ago. Closer study explained the formation as a geologic effect, all but ending the scientific controversy, explains Luhman.